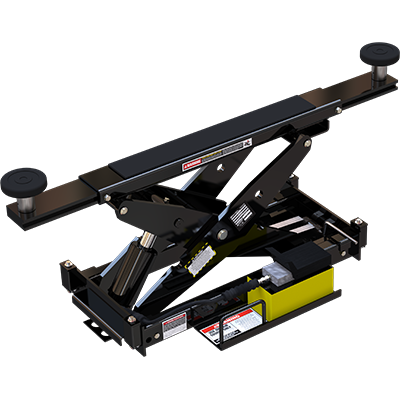 The HD-14 car ​lift is one of our most popular units for lifting medium-duty vehicles, as well as low-stance sports cars. Its extended approach ramps make it easy to safely engage your vehicle’s wheels, but what do you do when it’s time for a tire swap? Unless you want a two-post ​lift, as well, you’ll want a pair of BendPak’s RBJ7000 jacking beams. Each jack lifts half the vehicle frame. BendPak rubber contact pads are included with every rolling bridge jack we sell. The RBJ7000 pads engage the lift points of large vehicle chassis with ease. We recommend purchasing the optional frame cradle pads for larger trucks and SUVs, as well. Because different suspension rigs and vehicle bodies sit at different heights above the ground, the RBJ7000 rubber contact pads come with stackable adapters. This lets you reach the lift points without sacrificing how much rise you get from the jack. The adapters work on every vehicle type; all you need to know is whether the RBJ7000 is the right jack for what you want to lift. A single, air-hydraulic pump is fitted to the side of the RBJ7000 jacking beam. Your car ​lift has its own electric-hydraulic system that runs independent of your jack’s. After connecting the air line to the jack (needs 125 PSI and 10-20 CFM), an easy-to-use foot pedal activates the jack. For your convenience, BendPak ​jacking beams can be lifted to three different positions. They lock automatically as the jack rises and release together as the jack descends. Your car lift operations are separate from those of the ​sliding jack.